Shout Out for Georgia Breast Cancer! Earlier this month, on CBS46, The Georgia Breast Cancer Coalition received a shout out from one of our partners, Brides Against Breast Cancer. You can view the clip below. Meet Dr. Gulshan Harjee! Dr. Harjee has been a Board member of Georgia Breast Cancer for 3 years and adds a wealth of knowledge to our mission of education. In an interview with Dr. Harjee, she provided the following information. Why did you join GABCC? My passion is service and having battled breast cancer fortunately with Health Insurance it became a mission for me to join an Organization that would allow me to advocate for women who were not so fortunate as I am. I was recruited by Sheryl Cherico , our Chairwoman also a Cancer survivor with similar values . Breast Cancer , I believe has made me more aware of my own mortality , given me hope that I survived and made me much stronger spiritually and I believe I am more compassionate . I am paying more attention to what my patients are telling me. I am more aware that the clock is ticking . Your occupation? How long have you worked there? Tell us a little bit about your job. I am an Internist and the founder of First Medical Care Inc a State of the Art Primary Care that I was the CEO of for 30 years. We have received several Awards for patient satisfaction, for Excellence in Care and a Multitude of Award for Humanitarian work. Being that I am an interested in the whole patient and providing comprehensive care carefully listening, examining and analyzing the person‘s complaint, diagnosing and managing the problem for resolution. Breast cancer has become a major part of my concern for my patients. I educate them on the need for self breast exam and regular mammograms. Through my Position on a local Hospital Board I was able to bring a Local Philanthropist to invest into an updated Women’s” Center. What has been your most memorable part of belonging to GABCC? 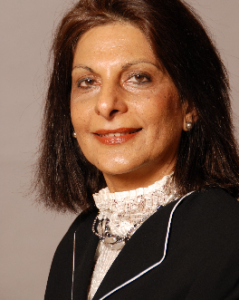 If you would like more information on Dr. Gulshan Harjee, or would like to speak to her, please contact us. 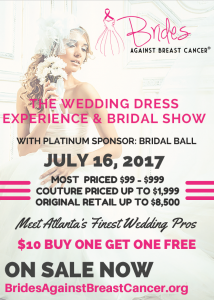 The Georgia Breast Cancer is proud to partner with Brides Against Breast Cancer® (“BABC”) for its nationally renowned wedding dress sale and bridal show in Atlanta on Sunday, July 16, 2017. BABC will offer over 800 wedding dresses for sale off-the-rack during the event at the Buckhead Intercontinental Hotel. BABC is a social enterprise company that shares it proceeds with the Georgia Breast Cancer Coalition. “‘The Wedding Dress Experience™ and Bridal Show’ is the largest wedding dress sale event in the country where a bride can take a dress home that day!” said BABC CEO Drew Edwards. “We’re excited to kick off our national tour in Atlanta. 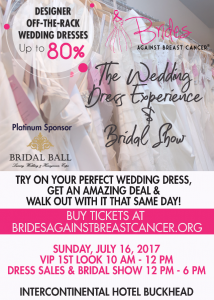 As always, brides-to-be will find an amazing selection of designer wedding dresses up to 80% off the retail price while supporting breast cancer causes! We’re very proud to partner with the Georgia Breast Cancer Coalition,” Edwards said. The Wedding Dress Experience™ and Bridal Show will feature over 25 vendors while showcasing 800+ designer wedding dresses uniquely available to be tried on and bought at the show. Brides typically save up to 80% off retail pricing. While the average new designer wedding dress retails for $1,700, the average price for a BABC certified dress is considerably less at $600. Most dresses are priced $99 to $999 and couture dresses up to approximately $1,999 (original retail up to $8,500). BABC dresses are either new, samples or in “like new” condition and are donated by bridal salons and individuals wanting to support breast cancer causes. BABC inventory includes dresses by famous designers Vera Wang, Maggie Sottero, Sophia Tolli, David Tutera, Allure, Liancarlo and more. BABC inventory comes directly from bridal salons and individuals across the nation. Since 1997, the BABC organization has helped more than 50,000 women purchase affordable wedding dresses and raised millions of dollars for breast cancer causes.